Synopsis: In a land governed by the cruel Frostblood ruling class, seventeen-year-old Ruby is a Fireblood who has spent most of her life hiding her ability to manipulate heat and light – until the day the soldiers come to raid her village and kill her mother. Ruby vows revenge on the tyrannous Frost King responsible for the massacre of her people. But Ruby’s powers are unpredictable…and so are the feelings she has for Arcus, the scarred, mysterious Frostblood warrior who shares her goal to kill the Frost King, albeit for his own reasons. When Ruby is captured by the Frost King’s men, she’s taken right into the heart of the enemy. Now she only has one chance to destroy the maniacal ruler who took everything from her – and in doing so, she must unleash the powers she’s spent her whole life withholding. Frostblood is set in world where flame and ice are mortal enemies – but together create a power that could change everything. Review: Frostblood is another 2017 brilliant YA fantasy from a debut author! 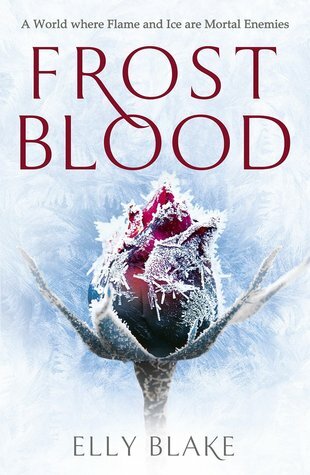 Cold, heartfelt, intense and intricate, Frostblood is an enthralling read and the start of what I believe will be a fantastic series. The story follows Ruby, a Fireblood in a world of ice. She has had to keep her gift a secret her whole life as the very thing that runs through her blood might be the thing that will get her killed. The story starts as Rubys’s village is raided by Frostblood soliders who kill her mother and take her captive. However her journey really begins when she meets a Frostblood warrior and a monk, who although are the enemy, seem to share the same goal: to destroy the cruel Frost King. It is here that Ruby starts to learn more – more about herself and her powers. As she has never been able to use her powers, she does not know how to wield or control it. In the heart of enemy territory she learns that frost and fire may not be so different, and that she may have the power to get her revenge. In the heart of a monastery filled with Frostbloods, Ruby is amongst enemies, but she is also amongst those who can teach her to use her powers properly. With the help of a surly and distant warrior, Arcus, if she can learn to control fire, she could defeat the evil that sits on the throne. The story and the characters are extremely well fleshed out, with a natural development (under the circumstances). Between the characters there is distrust and hope, animosity and loyalty. I just loved the way the relationships were built and I felt the natural development of a life-long hostility and desperation was brilliantly thought out. Ruby is our main protagonist, and she has a good mixture of determination and insecurity. Obviously she is unsure of these people who have offered her refuge, but more so she is unsure of her own abilities. Learning how to control fire is no easy feat when you are in a world of ice, but learning about herself is even harder. She is insecure and headstrong, impulsive and sassy. There is a really great mix of emotions and qualities that is shown for this character who has gone from hiding her secret her whole life to finding out she may be the secret to bringing down the tyranny that has eradicated her own kind. I loved the conflicting emotions and the disbelief in what she may be capable of, but yet the determination to try anyway. Arcus is the fierce Frostblood warrior who must help Ruby master control. He harsh, distant, impatient, secretive and yet oh so intriguing. He is dark and brooding with just the right amount of allure. He is a very powerful Frostblood, and it seems he has encased his heart in ice, but every now and then you get a hint sweetness about him, and it is enough to make you fall for this hardened warrior. I loved the conflict within this story, especially around the romance. There is frustration and swooning, confusion and yearning, bickering and carefulness and loads of tension and passion. Ice and fire collide in not a bang, but in slow burning romance that will melt your heart. The arc of the story and the characters was beautifully paced, even though there is a timeline on what needs to be done. I will admit there was predictably around certain things, in particular a certain character, but I absolutely loved the journey getting to these revelations. The world building was fantastic! I loved the contrast of fire and ice, and the imagery that goes along with it. The action was intense and necessary. The writing was beautiful and the story unravelled in a complicated but natural way. This debut is totally captivating. I cannot wait for the sequel! SO GOOD TO FIND SOMEONE ELSE WHO LOVED THIS BOOK AS MUCH AS ME! I was really surprised by this because I was NOT expecting to enjoy it this much but I really did! Great review Kirsty! This is one of my favourite books that I’ve read this year. Fantasy last year for me was a bit blah. But, this started off the year great. Plus the sequel comes out in August I think!